Well, I am gutted cos I wrote a long blog and only to find that it didn't save grrr!! so here goes again. l left Sydney on Monday 14 December to go on a trip to Perth and back with my French friend Lauriane. First stop was Melbourne! I spent about a week there but only few days actually in the city as I went to Great Ocean Road and Philip Island. Melbourne is lovely it has an European feel it that Sydney does not have. However, Sydney wins heads down when it comes to beaches!! Very dissappointed with Melbourne's beaches! But I loved the shopping, cultural and relaxed atmosphere. I even went on a cheesy Neighbours tour hahha!! it has to be done doesn't it! I met Dr Karl, he signed my Melbourne city map! It was a fun few hours! got to see the Ramsey street and learn a little about the show! I hear a lot about Philip Island and so I took a full day tour. It was lovely! it's mainly famous for the little penguines who come in at night to the shore after swimming all day! they are the cutiest thing you have ever seen, soo beautiful! I love this about Australia, how close you can get to nature and the animals! So Had a great time on that tour and met some nice fun people. The fun did not end there! I went on yet another tour: Great Ocean Road this time! The tour was excellent! Really good value for money! Had an amazing time viewing the great ocean rocks, the beautifully green landscapes and enjoying/sharing the experience with like minded people. Another success!! It was time to hit the road and say good bye To Melbourne! Frenchie as I like to call her! and i left for Adelaide on the 20th. We took the 10 hour bus trip there and arrived in Adelaide early morning on the 21st! The journey was not fun! We were both cold the whole way and we had to change buses!! It had been a while since I had done long bus trips and I found myself having to adjust to it again lol!! But it was all good! I didn't really think much of Adelaide. It was small and not much there to be honest! Although the locals were friendly enough! The place to see in Adelaide is Kangaroo Island. 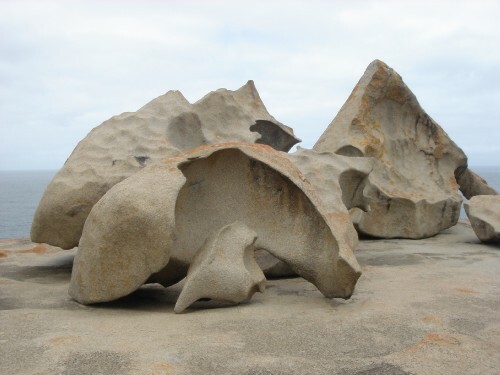 Best known for seals, penguins and Remarkable Rocks. Frenchie and I went on a two day, one night tour. The people on the tour and the Island was great but unfortunaltely we had the guide from hell!! He was moody, aggressive and well really spoilt the whole experience for us! I still have to write a letter of complaint about him and the company lol!! Anways, don't like to dwell on the negative! On a more positive aspect, it was amazing to get soo close to the seals! they were soo funny on the beach, looking half dead ahha! they hunt for food for about 3 days or 3 hours not sure anyways! and then through exhaustion they colapse on the beach to rest!! what a picture! I think I would have preferred to hire a car and have seen the Island at our own leisure. But we didn't have time to organise it properly! We spent Christmas Eve in Adelaide. What a strange night! We ended up in this club where I am sure everyone was off thier head! Wierd guys coming up to us and overall its the bizzare xmas eve! But we made it fun in the end! The following day we had to get up at 4 am lol to get our flight to go to Perth! I leave the next chapter untill anothe time! hehe like to keep you in suspence! Verne Cinnamon Magie Have not heard from you for several years now. Can you let me know where you are how you are doing?